What gives? English is a tough language to learn and anyone that says otherwise hasn’t paid close enough attention. It is riddled with inconsistencies, nuances, exceptions and rules that have rules that only sometimes work when applied. So if you’re an ESL student and you’re hitting some roadblocks – it’s okay. I commend you. Here we go. Word order matters. It matters like proper punctuation matters. When word order gets messy, so does your message which can lead to unnecessary complications and miscommunications. Which feels right? Hopefully A, because B is cannibalism. A: I read the book to Bobby and Sue. B: I read Bobby and Sue to the book. Did you guess A? If so, you’d be correct because English sentence structure typically follows the SVOI word order Subject-Verb-Object-Indirect object. So, keep the SVOI acronym tucked away for safekeeping and pull it out whenever you’re unsure. 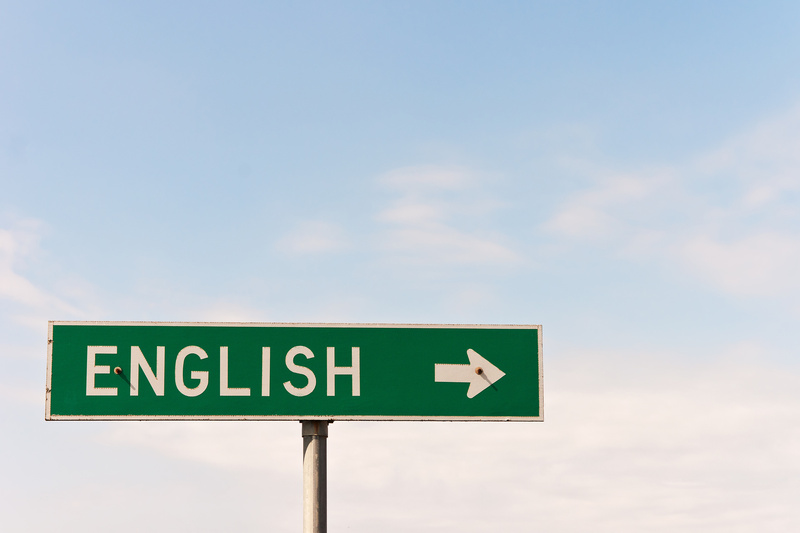 Let’s leave it to language maven Mark Forsyth to explain, quite humorously, why word order matters – and what native English speakers don’t even know they know. Hyperbaton is when you put words in an odd order, which is very, very difficult to do in English. Given that almost everything else in the English language is slapdash, happy-go-lucky, care-may-the-Devil, word order is surprisingly strict. John Ronald Reuel Tolkien wrote his first story aged seven. It was about a “green great dragon.” He showed it to his mother who told him that you absolutely couldn’t have a green great dragon, and that it had to be a great green one instead. Tolkien was so disheartened that he never wrote another story for years. The reason for Tolkien’s mistake, since you ask, is that adjectives in English absolutely have to be in this order: opinion-size-age-shape-colour-origin-material-purpose Noun. So you can have a lovely little old rectangular green French silver whittling knife. But if you mess with that word order in the slightest you’ll sound like a maniac. It’s an odd thing that every English speaker uses that list, but almost none of us could write it out. And as size comes before colour, green great dragons can’t exist. Now, will someone understand the sentence “The green great dragon went to the store”? Yes. Will the listener question English as your native tongue? Probably. This isn’t to say that sometimes this structure put forth by Forsyth has to be followed to a T, because it doesn’t. But next time someone describes something to you pay attention to what order the modifiers are in. Like learning idioms or language slang, learning the preferred order of words will come in time. Without verbs, we wouldn’t be able to communicate very well. Things would sound like, “Hey, I’m the game” and that doesn’t make a whole lot of sense. Am I canceling the game? Refereeing the game? Playing in the game? Verbs are important. In English there are 3 major tenses to remember: past, present and future. Now, there are actually 13 tenses, but they all fall under one of those three categories. The form verbs take in a sentence changes depending on what tense you are using. We can look at the simple present which is used to express something that happens all the time, not necessarily something that is happening right now. A: The sun rises everyday. B: Where do you live? A: I am learning about English grammar. B: I am making a phone call. We’re gonna learn about future tense. Gonna is a slang way to say going to which indicates future tense. A: We’re going to leave soon. B: He said he is going to finish the paper tomorrow. C: Ms. Elm said she is gonna give me a good grade. The words going to always need to be coupled with a verb to make it work. English is notorious for being confusing. Remember the verbs we just spoke about? Now it’s time to memorize which word does what when it’s plural. That’s a bit confusing, isn’t it? Confusing enough that people who have spoken English almost all their life still can’t make sense of it. English is crazy. For plurals there really is no better way to learn them than repetition. Of course, not all plural nouns are as complicated as that poem conveys. Most nouns just take an -s added to the end. Like, dogs, or curtains, or phones. But when there is a -ch, x, s, z or s-like sound at the end of the word you need to add an -es. Like, kisses, faxes, or couches. For words that end in o we sometimes add an -oes. Like, potatoes, or tomatoes. When a noun ends in a vowel + y drop the y and add an -s. Like, boys, corduroys, or ways. When a noun ends in a consonant + y, drop the y and add an -ies. Like, babies, studies, or daisies. Items that are countable can be plural. There are 7 plants. We have 2 cars. Uncountable nouns cannot be plural. Saying something like, “They had two silences” doesn’t make sense. In this case it could be, “They had two moments of silence”. One great thing about English is we don’t mess with gender articles. You’re not going to have to learn the masculine, feminine or neutral counterpart to any noun. So if your native tongue is let’s say, German, this will be a bit easier for you. If your first language is Japanese (where no articles are used) you’ll likely struggle a little with this concept. Articles are a, an, and the. They go before nouns. A: The tree swayed in the wind. B: A little girl wrote on an envelope. A: Tree swayed in wind. B: Little girl wrote envelope. If something is singular (tree) use a. If something is plural (trees) use the. If the noun starts with a vowel (envelope) use an. In the end, nothing beats practice, practice, practice. Don’t be ashamed to use your English when you’re out and about – that’s the best way to get better. Brittani is a writer and web designer with many years of experience across many industries. She spends her free time traveling, studying natural medicine + nutrition, mushroom hunting, learning how to cook worldly dishes, and taking pictures.